Between the likes of picplz and Instagram, image-sharing sites are making plenty of headlines these days. And there’s one obvious offshoot that seems ripe for similar services: video. Granted, Path offers support for video, but it’s semi-private and there could still be an opportunity for a more public service to tap into this trend.That’s where Justin.tv’s upcoming app Socialcam comes in. The app, which remains in a very limited beta, is looking to to offer a straightforward way for people to capture and share their videos with friends — and yes, it’s doing that in a way that is very similar to Instagram and picplz, which isn’t necessarily a bad thing. I sat down with Justin.tv founder Justin Kan and VP of marketing Matthew DiPietro to get a tour of the app, and have also gotten the chance to play around with the Android version myself. Kan says that it’s frustratingly difficult to share video taken on your phone with friends: email attachments are a pain because of size issues, and MMS leads to heavily degraded video quality. YouTube makes it easy to upload directly from your phone, but the focus there doesn’t seem to be on sharing your clips with a network of friends. 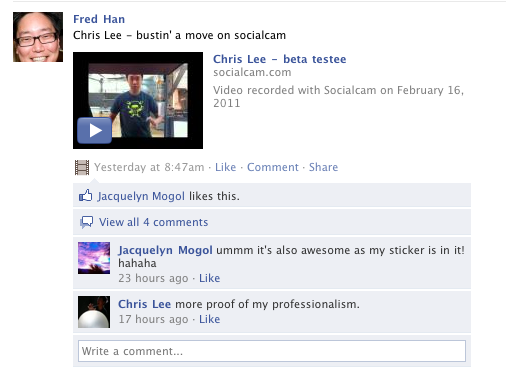 And posting a video to Facebook is way harder than it should be, which is why the company started working on Socialcam last fall. A significant number of Justin.tv videos are watched as archived footage (as opposed to live streams), but this is the first time the company will be launching a product that’s dedicated exclusively to recorded footage. The app, which will be available for both Android and iPhone, is pretty simple: after firing it up you’re asked to log-in via Facebook Connect, which is currently the only login option. The app presents you with a list of your Facebook friends who are already on Socialcam and asks if you’d like to ‘Follow’ them (Socialcam uses a one-way follower model like Twitter). 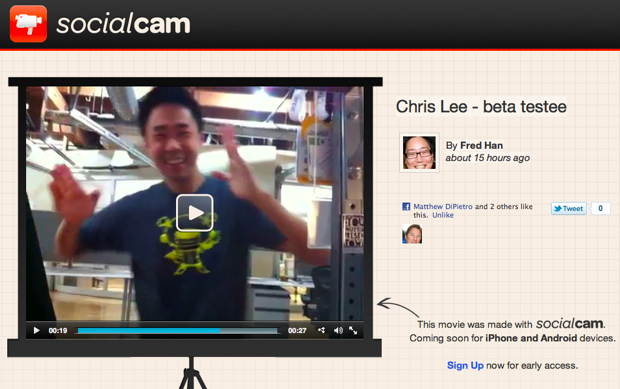 After that, you’ll spend most of your time looking at the stream of Socialcam videos posted by your friends. Each video is represented by four frame grabs — tapping on one will cause the video player to pop open the clip will start playing immediately. 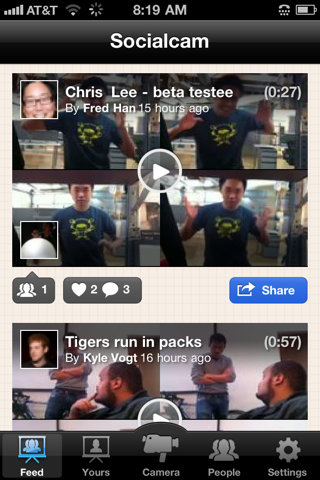 You can leave comments and ‘Like’ each video, and you can also tag your friends in clips. If you tag a friend who isn’t on Socialcam, it will still show up on their Facebook wall (and the video is playable directly from there — you don’t have to click a link). There are a few other nice touches. I’ve been using the Android app, and aside from some quirks you’d expect from a beta, it’s clear that a lot of attention is being given to the UI, with smooth transitions and so on. One of my favorite features: Socialcam uses face identification when it generates the preview thumbnails for each video, so you wind up seeing photos of your friends instead of a shot of someone’s shoe or the wall. The application also uses “streaming upload” — as soon as you start shooting a video, it will start uploading to Justin.tv’s servers, which reduces how long you’ll have to wait before you can publish it. Kan and DiPietro acknowledge that they aren’t the only ones looking to launch an ‘Instagram/picplz/etc’ for video — given the popularity of these services, it’s an obvious idea. There will be plenty of competition, but Socialcam has a chance at being first to market, with launch planned for just before SXSW. Of course, there’s still the question of whether users will be as quick to latch onto a video-oriented sharing service — people tend to get more upset when you post a video of them without their permission, and it’s obviously quicker to take a snapshot. Oh, and the first 20 people to sign up at this link will be added to the beta. Be quick!